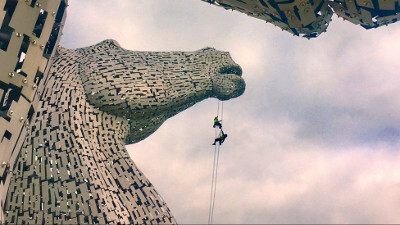 IT IS all in a day's work indeed for Francois Botha, maintaining the Kelpies. These are the two Kelpies, the Scots name given to a shape-shifting water spirit inhabiting the lochs and pools of Scotland and has usually been described as appearing as a horse, with the two at Falkirk on the Forth & Clyde Canal being recognised as the largest equine sculptures in the world. Francois who has been busy working on the sculptures is well aware of the dangers of working at height, but has been doing it for the past 20 years working usually on high buildings.